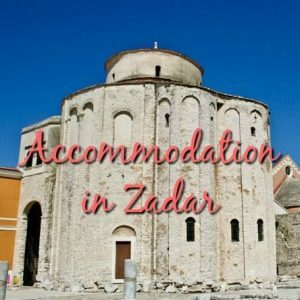 Here are some of the options for hotels and private accommodation in Zadar in North Dalmatia, one of the most charming towns in the whole of Croatia. As you’ll see, hotel accommodation is plentiful, with a whole host of hotels for different budgets. You’ll also find family-style holiday resorts located close to the town. There’s also numerous private accommodation options, as well as some hostels in town too. Of the other towns mentioned in the list below, Sukosan is 10km away from Zadar; Petrcane is 14km to the north; Sv. Petar is 19km away; Vinjerac is 34km and Starigrad-Paklenica is 40km north of Zadar. Zadar has its own airport so is easily reached from a number of UK and European airports. See Getting to North Dalmatia for more details. Boutique Hostel Forum Visit Croatia Recommends! Super stylish hostel in a perfect location on the main pedestrian street in Zadar Old Town. Twin/double rooms and beds in 4-bed mixed dormitories available.